Disclosure: I was compensated for this post by the US Highbush Blueberry Council as part of the Mom It Forward Blogger Network. All opinions expressed are 100% my own. If you asked me to tell you my favourite type of berry, I wouldn’t hesitate to answer. It’s always been blueberries. I was a very picky eater as a child and the only berry I would eat was blueberries. My mom would put them in a small bowl and I’d eat them plain. Little did I know they were good for me. I just thought they tasted good. Now that I’m adult, I understand all the health benefits of blueberries. First off, they are low in fat and only 80 calories a cup. They also contain a phytonutrient: polyphenol. It’s acts as an antioxidant and anti-inflammatory that can help with chronic conditions like cardiovasicular disease, cancer, etc. I always think of anti-aging when I think of antioxidants. 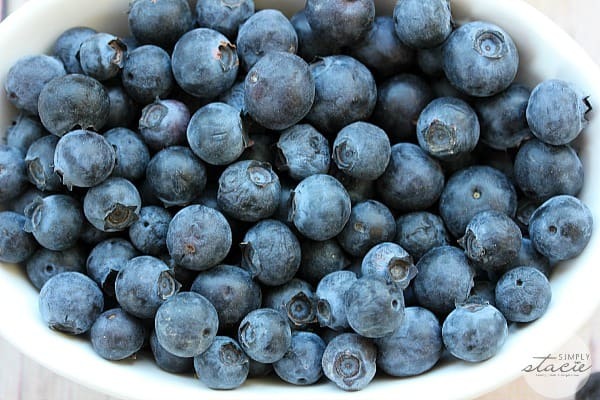 Blueberries are also loaded with Vitamin C and an good source of fibre. Highbush blueberries are the ones you find at the grocery store. They are grown on bushes that can grow as high as 12 feet tall. Each spring, beautiful white blossoms begin to grown all over the bushes and bees come to pollinate. Each blossom then becomes one blueberry. At first, they are hard and green and then change to a reddish-purple. When they turn blue they are ready to pick and eat. When buying fresh blueberries, the US Highbush Blueberry Council recommends you look for ones that are firm, dry, plump and smooth-skinned. They will have a silvery surface bloom and no leaves or stems. The colour should be deep purple to blue-black and size doesn’t matter! 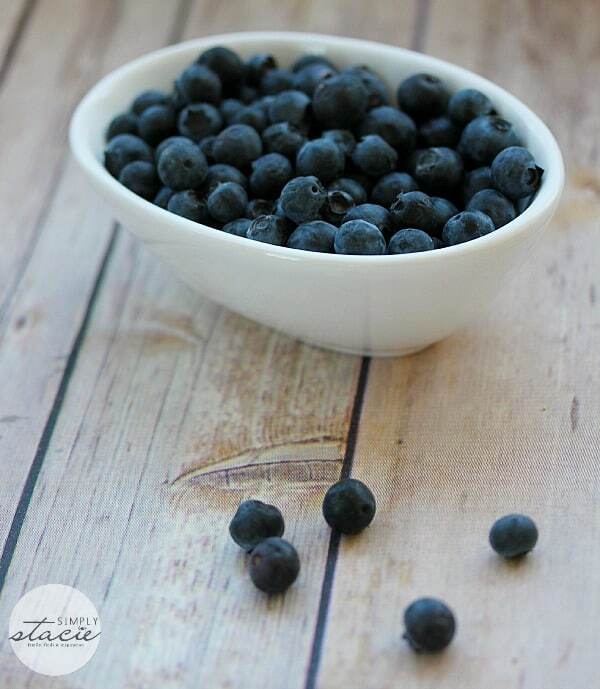 Store your blueberries in the fridge at home and make sure you eat them within 10 days of purchase. Though I enjoy snacking on blueberries on their own, I do use them in a variety of recipes. A few simple breakfast recipes include blueberry smoothies, blueberries and yogurt and blueberries and oatmeal. 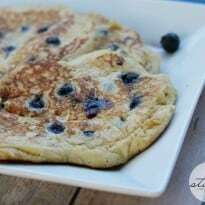 Another one that our family enjoys is Whole Wheat Blueberry Pancakes. I like that this recipe doesn’t have a lot of sugar and you could even substitute honey in place of sugar if you wanted to cut it out completely. The fresh blueberries add an extra element of sweetness. Even John likes this recipe and he normally doesn’t like my “healthier” picks. Shhhh don’t tell him it’s good for him! 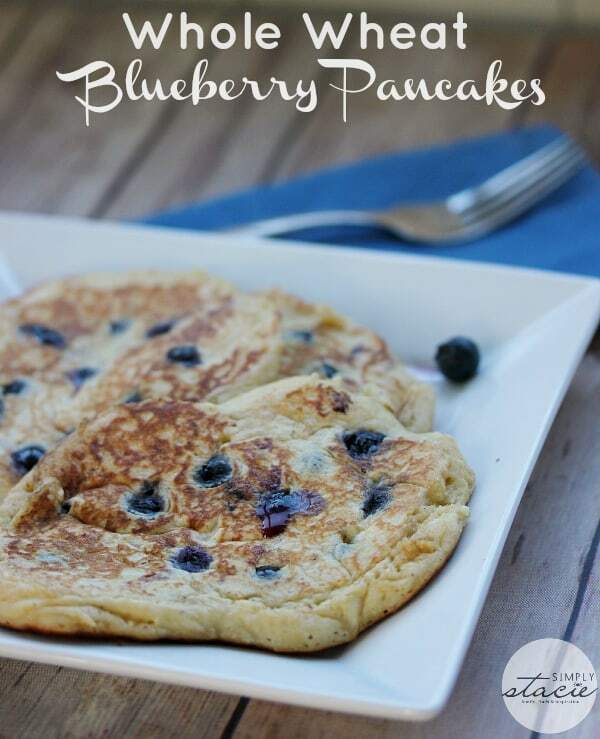 For more blueberry recipes, visit the US Highbush Blueberry Council website. Mix together the flour, sugar, baking powder, baking soda and nutmeg in a small bowl. In a separate bowl mix together, ricotta cheese, eggs, lemon juice and buttermilk. Add a tbsp of oil to a pan on the stovetop over medium heat. Add a scoop of batter (about ¼ to ½ cup depending if you like your pancakes big or small) to the pan and drop blueberries on top of each pancake. Flip the pancakes over once the pancake starts to bubble. Cook for an additional 2 minutes or until cooked to your preference. Repeat this process until the pancake batter is gone. 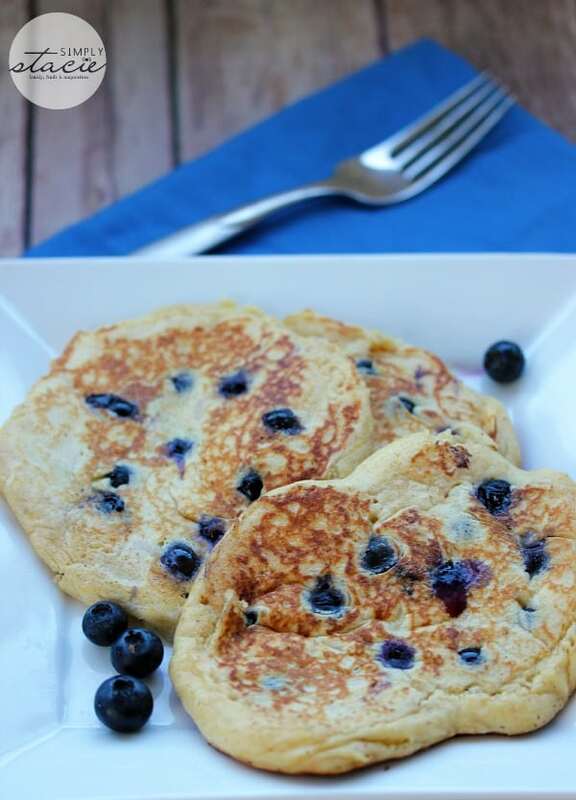 Top pancakes with fresh blueberries or maple syrup. I love the blueberry cheesecake! I would like to try the Boo Berry Milkshake. Sounds refreshing. I would love to try the Blutini Royale!! The Waffles with Spiced Blueberry Sauce look amazing! Yum! The Blueberry-Chocolate Mousse Tarts look amazing!! I would like to try the Blueberry Fruit Shake recipe. Blueberries are one of my favorite fruits. I would love to try the recipe for Scandinavian Blueberry Bisque. I would like to try the Blueberry-Wheat Berry Salad. I would like to try the Blueberry-Chocolate Mousse Tarts. It looks very good. I love blueberries and the Double blueberry pie looks really good. Thanks for having this contest. I would like to try the Blueberry Scones recipe. Thanks we love anything Blueberry,sounds yummy !